Selling equipment / what to do? Elevation and auto-flexion in a quality table. Many other options available. USA made quality cloth back 2x2" electrodes. Classic design and made in USA. 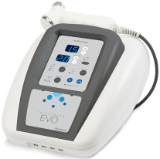 Full line of USA made electrotherapy. American Classic / full line available. Decompression Therapy / Includes lumbar and cervical traction. Richmar is made in USA with 45 years of experience. They have the best warranty in the business - 3 years. They are the Mfg of the world famous Hands Free Ultrasound. Chattanooga (DJO) is the most recognized name in the world. They offer quality products at a very competitive price. They are the Mfg of the world famous Triton DTS decompression therapy.